The content of this article provides interesting history, facts and information about Gladiator Techniques. The techniques used by Roman Gladiators depended on the type of weapons that they used and the armor that they wore. Heavily armored gladiators were well protected but restricted in his movements by his equipment. Lightly armed gladiators would have freedom of movement and speed but with little to nothing to protect him. The gladiator fighting techniques therefore varied from one gladiator to another. The pairing of gladiators in the arenas were important and ironically the Romans expected to see 'fair play' in gladiatorial combat. Matched pairs of gladiators of would ensure that one fighter was hampered by heavy armor whilst the other Gladiator had only minimal armor which allowed freedom of movement. The lightly armed Gladiator Techniques were used by one of the most famous types of gladiators - the Retiarii (Net Fighters). A Retiarius (pl. Retiarii meaning "net-man" or "net-fighter") was a Roman gladiator who fought with equipment styled on that of a fisherman. The Retiarius (Retiarii) were lightly armored, wore no helmet, carried no shield so they had the advantage of agility, mobility and speed. These factors were all taken into account when adopting his combat technique. The Retiarius fought with the heavily armed gladiators such as the Mirmillones. His fighting technique was evasive and his tactics were to entangle his opponent with his net and then skewer him as a fisherman with his trident. 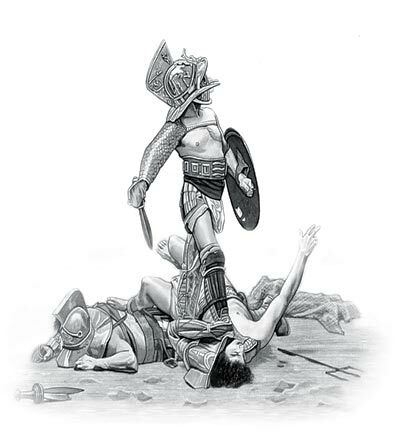 A heavily armed gladiator like a Myrmillo (Murmillo) often fought with a Retiarius. The Gladiator Techniques of the Murmillo were very different from his opponent. This type of gladiator fought with a sword (first the the gladius which was eventually replaced by the Spatha). He wore armor consisting of an Ocrea, or metal greave, on the lower left leg and his right arm and wrist was protected by a manica of tied linen or leather. The Murmillones carried a large, rectangular, semi-cylindrical body shield called a scutum and wore a helmet with a stylized fish on the crest (the mormylos or sea fish). The helmet featured small eye-holes to prevent the narrow prongs of the Retiarius' trident from penetrating to the eyes. His fighting technique was to avoid being entangled in the net and his tactics were to barge his opponent with his shield and thrust with his short sword. There were also additional gladiators who specialised in many different combat styles and Gladiator Techniques. Some gladiators fought on horseback, others from chariots. Other gladiators specialised in fighting wild animals called Bestiarii (Beast Fighters) others specialised in participating in wild animal hunts. Bows and arrows and lances might be used together with a range of other weapons all requiring different forms of gladiator techniques. For a complete list click Types of Gladiators. Gladiator Techniques for all of the different types of gladiators can be assessed by understanding the weapons and armor used. His techniques would also vary according to the armor and weapons of his opponents. The content of this Gladiator Techniques category on life in Ancient Rome provides free educational details, facts and information for reference and research for schools, colleges and homework. Refer to the Colosseum Sitemap for a comprehensive search on interesting different categories containing the history, facts and information about Ancient Rome. Just like the subject of Gladiator Techniques there is hardly a page of Roman history and the Romans that is not, on some way, connected to the Roman Colosseum which became a symbol of Rome, its society, culture and life.